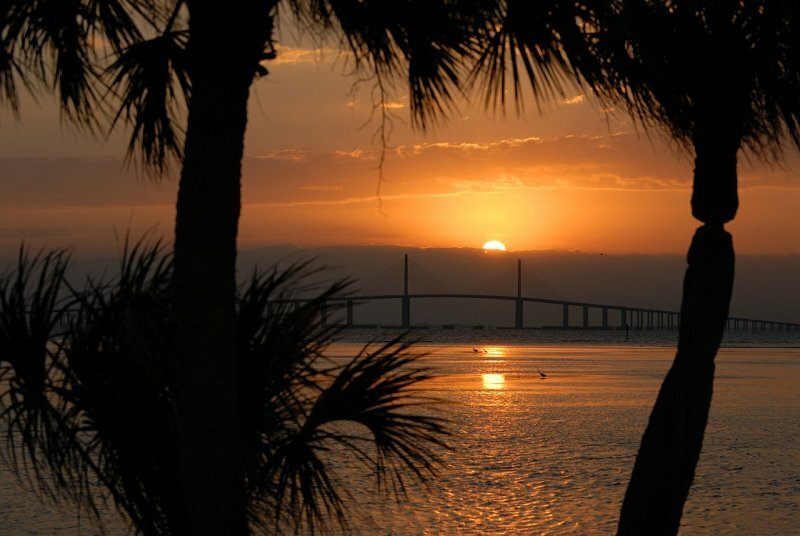 This is the Sunshine Skyway Bridge. 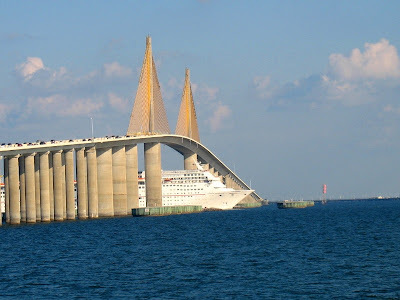 It crosses the mouth of Tampa Bay and it separates the Bay from the Gulf of Mexico. The bridge connects St. Petersburg and Terra Ceia, the town immediately across the water from St. Pete. The entire length of the bridge is five-and-a-half miles and I rely on my many crossings to serve as a kind of mini vacation. Mobile service cuts out about half way up the center span and doesn't kick back in until you cross to the Terra Ceia side. I used to find that to be irritating but these days it's one of my favorite things about that bridge. It's a five minute respite from being available. 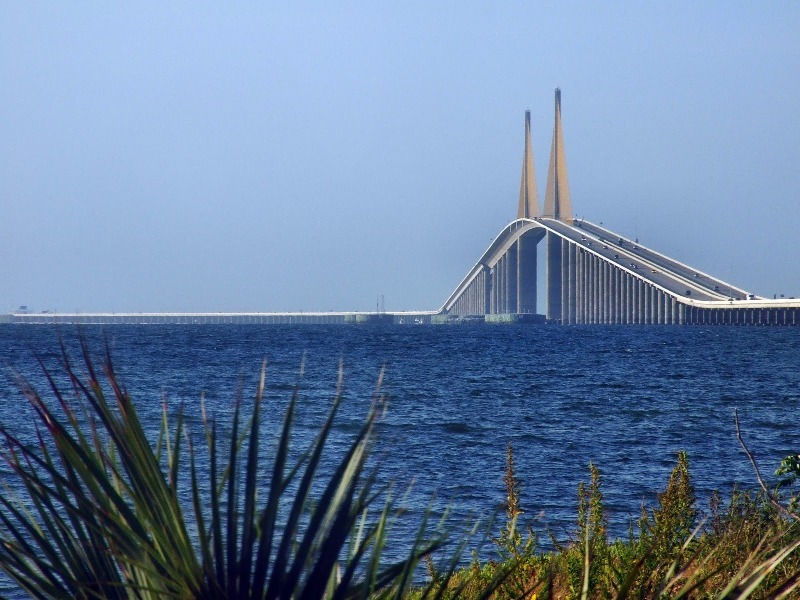 It's the tallest thing around here and if memory serves, at 431 feet, it's the tallest bridge in Florida. 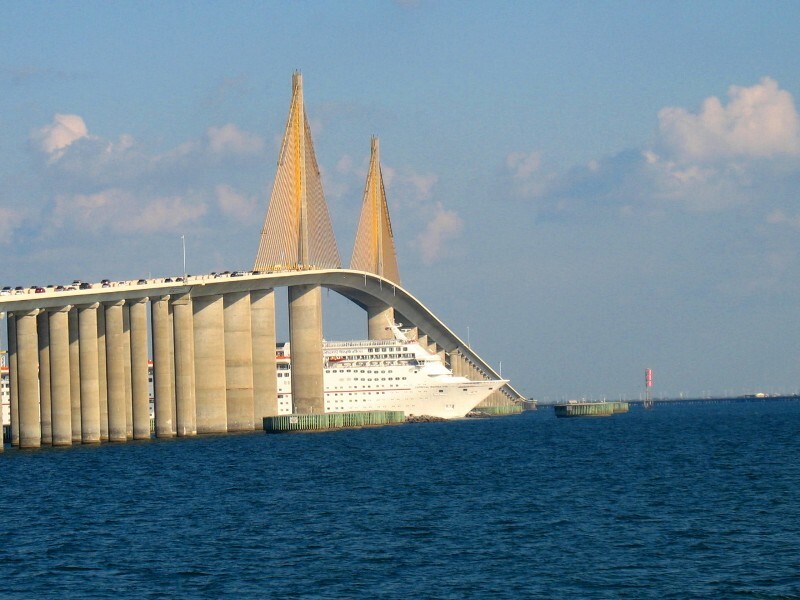 As tall as it is, it's a singular thrill to be crossing it when a cruise ship squeezes underneath it. Driving north and home to St. Pete never ceases to inspire me. It feels like I'm landing an airplane on the downside of the hump and no photo I've ever seen or taken has come close to capturing the azure-emerald clarity of the water of the south Bay. "I live in paradise" I say to myself every time I'm making that drive. It's difficult to live here and be near the water and not see that bridge. It looms over everything and it serves as our visual anchor. 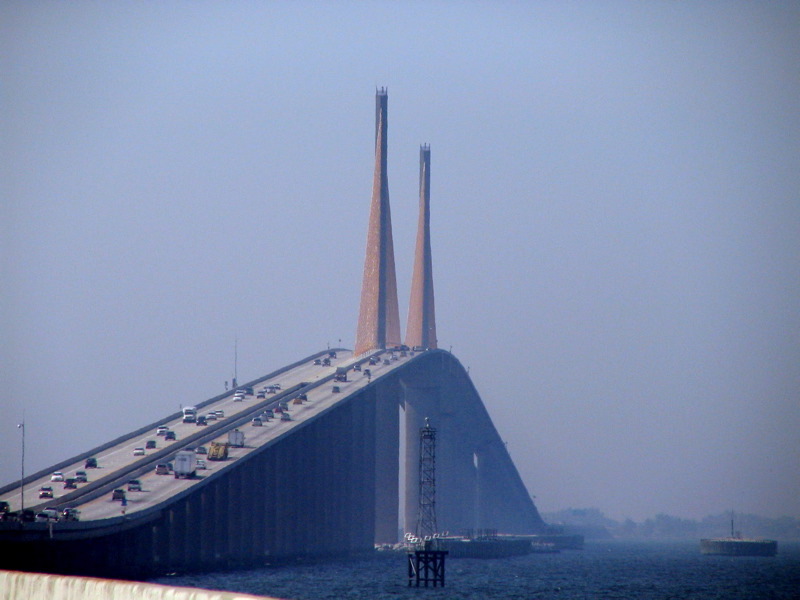 No matter where you are on land, air or sea, seeing the Skyway is an automatic location beacon. It's the pivot point around which the entirety of south Pinellas and north Manatee counties rotate. It frames the sunsets and reminds me of the vast expanse and possibility of the Gulf of Mexico on its west side. The whole world's out there, just waiting. That steel and concrete can join together to form such sculptural utility gives me hope for humanity. It reminds me time and again that art can be anywhere and that beauty abounds, it's just a matter of taking the time to make it and to appreciate it. More than just about any other feature of the the part of the country I call home, The Sunshine Skyway feels like it's mine. It feels like my retreat, my point of reference, my personal bridge. No matter what happens, no one can take that away from me. And what a bridge it is. Great post Paul - I love the Skyway also. It's majestic. It's an amazing structure, that's for sure. Too bad my sister can't drive over it!! She doesn't know what she's missing! It IS your bridge, doll, and nothing can take that away from you. Missing you terribly this Easter Sunday. 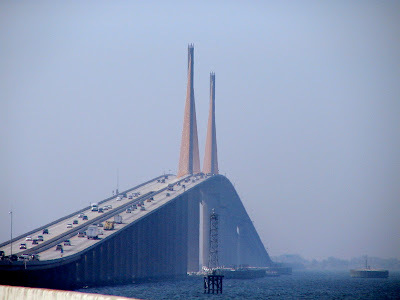 The Skyway is majestic. A beautiful piece of architecture. The photo with sunset is so beautiful. I can´t describe why, but I love bridges more than any other buildings, structures or sculptures. One of the reason may be that they are connecting places. Somewhere deep in my subconscious the feeling of being close, connected to someone makes me feel satisfied. 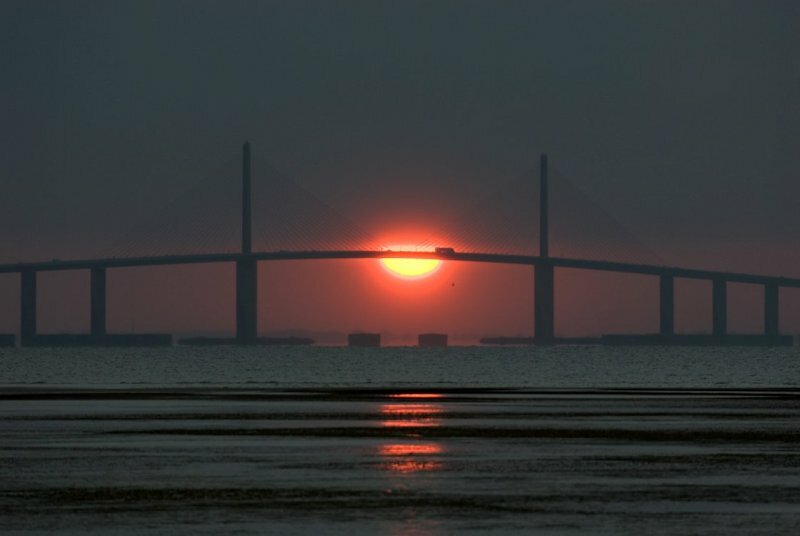 Spot on, and thank you for the gorgeous memories I have of the Skyway from the mid-'90s, although I live in KY. I drove over it in 2010, and plan to in 2011, even though gas will be steep. A connecting piece of sculpture. Terrific blog again. My wife and I feel the same way about San Diego, our own personal slice of paradise. We don’t often drive over it, but the Coronado Bay Bridge is several hundred feet high, not as high as your bridge, because it’s naval ships that pass under it, not the skyscraper-on-the-water cruise ships. Regardless of where one lives, though, if one genuinely loves it and is convinced there is absolutely no better place on earth, that’s the ultimate. 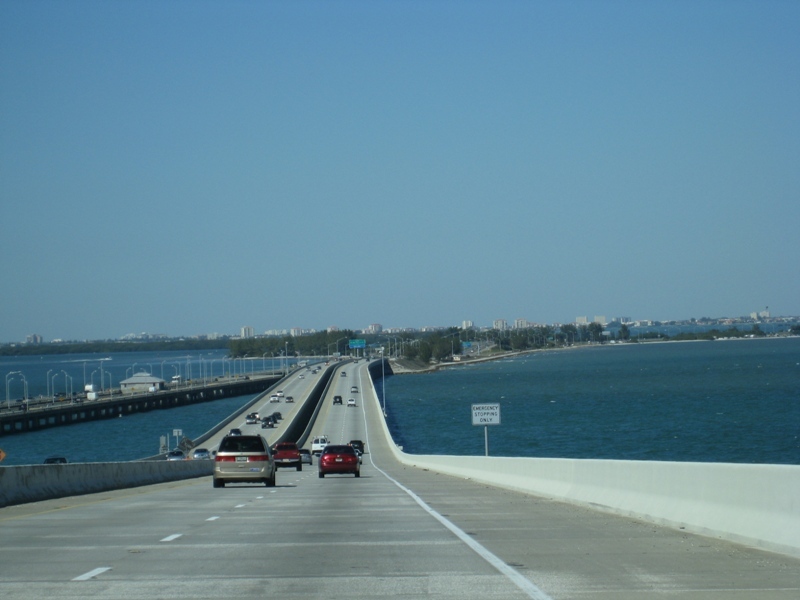 I remember crossing this bridge on a Greyhound bus from Tampa back to Ft. Lauderdale, the very first time I visited the USA. A woman on the bus was having a panic attack because she had a phobia about traveling over water (so do I) and someone had told her that the waters were shark infested. I remember not looking out of the bus window and thinking - " If we were home in Trinidad, the sharks would be fried and eaten with bake and pepper sauce". Strangely, though, I love bridges and I love the shape of this one. Hi Paul, Melissa from UK here. I was in Florida last week (doing disney with the kids) and I drove from clearwater to st pete and thought of you! Went to a HUGE brilliant bookshop (family business - you'll know the one I mean) and dropped $200 before driving back to Orlando and the land of the big mouse. It is so beautiful around there. 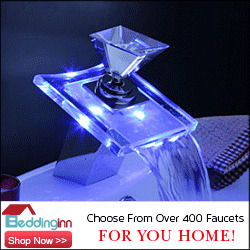 You are very lucky! All the Snaps of the Bridge is looking really awesome. All the Bridge 's making Idea are Different. Nice Bridge. Now that is a lovely bridge! Strength and grace. It reminds me of my local favourite, the Gladesville Bridge -- I love the curves. I'm also keen on the Anzac Bridge. The Sea Cliff Bridge down at Wollongong is pretty special too. Who's ready for an Onion? Want to be a hero every morning? Can we let this one die?